New Mini Mural in the Heights! Please join us for the unveiling of the Heights’ First Mini Mural Art Box designed by local artist, Shelbi Nicole. 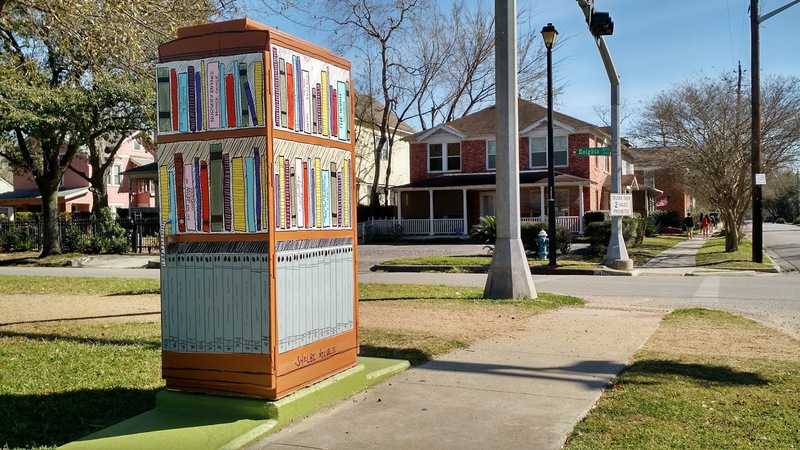 The Mini Mural Project is a civic arts project dedicated to beautifying the city one utility box at a time. I’m the proud sponsor of the first one to appear in the Heights – right on the esplanade of Heights Boulevard. The Heights Mini Mural depicts a colorful bookshelf with some of my favorite titles. I encourage you to bring your favorite books to donate for a future little library that can be visited 24/7 in the neighborhood. Along with face painting for the kids and a raffle, we will also have the ribbon cutting ceremony for our new Why I Love Houston Properties Office on 1333 Heights Blvd., conveniently located near the Mini Mural. I love that I get to see the Mini Mural on my way to work and enjoy being a part of this community-wide effort to transform the ordinary into extraordinary works of art.